Last summer, India witnessed a number of grisly acts of anti-Muslim violence: ten Muslims were lynched or murdered. 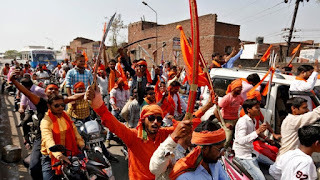 Yet in December, when a Hindu man hacked and burned a Muslim labourer in Rajasthan, there was something particularly macabre about it – the attacker had filmed the murder and shared the video on social media, and it was shown on television. Murder was no longer merely news or a statistic. In the video, the attacker could be seen justifying his actions (to “protect the honour of Hindus against Muslims”). As the weeks went by, we learned more about the murder. There was a love triangle involved; the girl whom the attacker was besotted with had eloped with another man, a Muslim; to get even with his rival, the attacker had plotted murder but, in his unhinged state, killed another Muslim by mistake. Or so the story went. How did the well-meaning, quiet man turn into a murderer? That question assumes greater significance if we step back from the Rajasthan case and behold the broader canvas: how did rail passengers, neighbours and villagers in the country turn into Islamophobic lynch mobs? Surely they too were normal ordinary people until some point in their lives. When and how then did these people become vicious? What incites ordinary people to commit heinous crimes? Until they tell us how they developed murderous instincts, we can look elsewhere to similar normal peaceful people who metamorphosed into brutish murderers and also documented their violent transformation. For studies suggest regularities in some forces turning ordinary people to violence. Melita Maschmann was a simple schoolgirl in Weimar Germany until the Nazis took power in 1933. That year, she defied her parents to join the Hitler Youth. In her memoir, translated and published in English in 1964 as Account Rendered, Melita narrates her transformation from an ordinary teenager to a Nazi propagandist and official who supervised ethnic cleansing in Poland. Systematic manipulation of the German psyche centred on a design that falsehoods, when repeated often enough, would make people believe them. To that end, Joseph Goebbels, the propaganda minister, orchestrated the vilification of Jews to a deadly crescendo. Powerful anti-Semitic lies warped German minds and deadened morality to such an extent that violence seemed and became normal. The consequence was murder on an epic scale. The path that took ordinary Germans to ethnic hatred and savagery traversed a dark valley of toxic myths about ethnic minorities. That valley of transition not just made Germans complicit in mass murder, but also killed in them the basic virtue that respected the sanctity of human life. India too, it seems, is now standing at the entrance of a dark valley. Virulent lies about Muslims that turn normal ordinary people murderous are circulating in the country. That “well-meaning, quiet man” in Rajasthan, we now know from police accounts, was on a toxic diet of “hardline Hindutva videos” that “fuelled his hatred towards Muslims”. And he is not the only one in the country on a diet of Islamophobic myths. Of considerable currency these days is the claim that the Muslim population share will overtake that of the Hindus and turn India into an Islamic nation. There are three strands to this argument. Hum paanch: the insinuation that Muslim men are polygamous since Sharia law licenses men to have up to four wives, whereas Hindu men are monogamous. Hamare pachees: the charge that an animal cycle of reproduction prevails among Muslim women leading them to have numerous children (five per woman so that Muslim households are rendered “child producing centres”, according to one purveyor of this view), while most Hindu women have just one or two children. Love jihad: the claim that young Hindu women are seduced by Muslim men and converted to Islam to boost Muslim numbers.